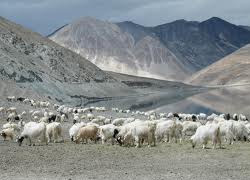 When you talk of Leh Ladakh, the scenes of pristine beauty enveloping the snowy mountains automatically comes to mind. And this beauty is certainly a great fancy ticklers for newly weds who feel like celebrating their honeymoon in Leh Ladakh.Leh, a much admired and well recognized ‘snow desert’ is filled with numerous ancient monasteries that are more than enough to take your breadth in an instant with their noteworthy architecture. There various monasteries show the deep holy zeal of the Buddhists. The significant Indus River casts its unmatched charm all across its very surroundings. And therefore, those who select Leh Ladakh honeymoon Tours do make it a point to indulge in the sports activities river rafting, mountain biking, etc. if they are bent upon enjoying the amazing adventures. Another interesting thing that fascinates you during your Leh Ladakh honeymoon tours involves camel and yak rides that provide you great amusement. So, you must plan your honeymoon tours in Ladakh to bask in the beauty of valleys, rivers as well as flowers. Leh Ladakh is peppered with a series of amazing attractions that are undoubtedly a real treat to the eyes of the honeymooners. Honeymooners fond of having their honeymoon in hill stations come to Leh Ladalh and delve into the places like Tso Moriri Lake and Pangong Lake, that let you both feel lots of serenity and beauty. Apart from the beauty of the Tso Moriri Lake, there also exists lively wildlife to tickle your fancy. And the ravishing beauty of the Pangong Lake shows the changing colors of the lake water with the falling sunlight over it that makes it all the more captivating. Truly, these lakes are perfect for adding a unique aspect to your honeymoon in Leh Ladakh. Your Leh Ladakh honeymoon Packages also take you close to the amazing valleys such as Drass Valley, Zanskar Valley and Nubra Valley. The beauty of the Drass Valley gets ameliorated with the vibrant Drass River in the proximity. And this valley is considered to be the second coldest zone of the world. Zojila Pass is an important region of this valley. Devotees pass through this valley to reach the sacred Amarnath Cave. Nubra Valley, on the other hand is peppered with greenery and vegetation to amuse honeymooners, who can also try out trekking over here. During the summer season, the valley gets amazing variety of yellow and pink roses that you can sprinkle over your sweetheart to make your moments all the more romantic. And this is what makes your India Honeymoon Packages all the more interesting. Zanskar Valley delineates the sheer Tibetan culture and amuses you with its enchanting Zanskar River. Another attraction that draws your attention during your honeymoon tours in Ladakh is the fascinating Rangdum Village. This village is an obvious treat to your eyes as its mountains and hills as well as beautiful pasture lands draw your attention in a moment. In addition to this, Khardung Pass and the Padum Buddhist Centre form other places that truly deserve your visit during your Ladakh tours. Accommodation on twin sharing Basis as per Package. To & Fro Airport Transfers As Per Package. All Transportation by Toyota Qualis / Scorpio/ Innova / Sumo Grand.